In 2-quart saucepan, place eggs in single layer. Add cold water to at least 1 inch above eggs. Cover and heat to boiling; turn off heat. If necessary, remove pan from heat to prevent further boiling. Cover and let stand 20 minutes. Immediately run cold water over eggs or place them in ice water until completely cooled. To remove egg shells, crackle shells by tapping gently all over; roll between hands to loosen. Peel, starting at large end. Cut lengthwise in half. (For a different twist, eggs can be cut crosswise in half. Cut a thin slice off the bottom of each egg so it will stand up without falling over.) Transfer yolks to small bowl; mash with fork. Set egg whites aside. Stir mayonnaise, parsley, horseradish, mustard, salt and pepper into yolks. Fill whites with egg yolk mixture, heaping it lightly. (Use a teaspoon to fill the egg whites and to spread the yolk mixture easily and neatly into the whites.) Cover and refrigerate up to 24 hours. Why it Works: No Green Eggs Here Hard-cooked eggs become tough and tinged with green when exposed to heat for too long. The more egg proteins are heated, the more water they lose. After too much heat (usually anything more than 20 minutes) the eggs turn rubbery, and a sulfur compound and the iron in the yolk react to make an unsightly green ring. You can avoid these problems by cooking the eggs only as long as necessary and stopping the cooking by plunging the cooked eggs into ice water. To avoid the green color, use recently purchased eggs; they do not react as easily. Recipe Rx: Off-Centered Yolk You followed all the steps to cook a perfect egg only to discover, after peeling, that your yolk is positioned right on the edge or bottom of the white. 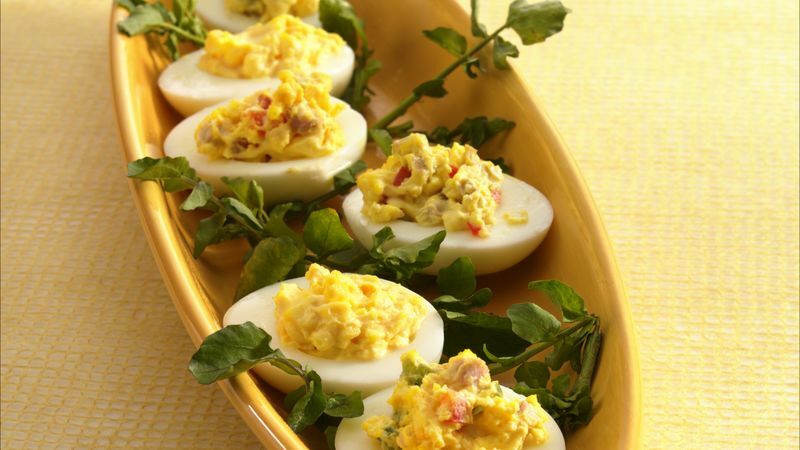 Because deviled eggs are all about presentation (the special plate, garnish, etc.) this can really mess up your plans. To prevent the yolk from moving off-center, simpy store your raw eggs in the carton, on their side (overnight should do). The little strings that hold the raw yolk in the middle of the white will move it back to the center, and after boiling you will have perfect egss to fill.